Robert Fitzharding founded the church belonging to St Augustine's Abbey on this site in 1140. It was granted cathedral status by Henry VIII in 1542. In 1298 Albert Knowle began to rebuild the Norman church. This continued for several centuries and his style was reproduced throughout Europe. 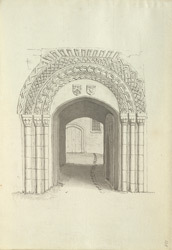 This Norman arch shows characteristic zigzags and interwoven zigzag designs atop scalloped columns.